Download a pair of passes to see Monster Trucks in West Palm Beach! You can download an admit two pass to see the new movie Monster Trucks at Cinemark Boynton Beach 14 and XD - 1151 N. Congress Ave., Boynton Beach, FL 33426, on Saturday January 7th, 2017 at 10:00am. Looking for any way to get away from the life and town he was born into, Tripp (Lucas Till), a high school senior, builds a Monster Truck from bits and pieces of scrapped cars. After an accident at a nearby oil-drilling site displaces a strange and subterranean creature with a taste and a talent for speed, Tripp may have just found the key to getting out of town and a most unlikely friend. 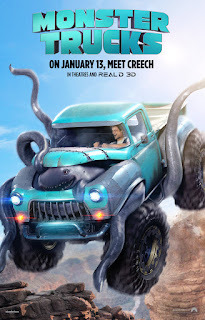 Melding cutting edge visual effects and state-of-the-art CGI, Monster Trucks is an action filled adventure for the whole family that will keep you on the edge of your seat and ultimately touch your heart.